Ground covering plants typically consist of low-growing perennials and vines that rapidly spread to form dense mats. Gardeners often use ground covers to add ornamental interest to the landscape as well as provide erosion control. Ground cover plants often work well on steep slopes, in shady areas beneath trees and in very dry or very wet soils. If you are interested in planting ground covers, select plants according to appropriate zone, mature size, general culture and intended use. The grassy-leaved sweet flag (Acorus gramineus) naturally occurs in the wetlands of East Asia and performs well in United States Department of Agriculture (USDA) Hardiness Zones 6 to 9. This Acoraceae plant family member ranges from 6 to 12 inches in both height and spread. Non-showy, yellowish-green flowers bloom in May and June, followed by small, red berries. Grassy-leaved sweet flag plants also bear fans of green leaves that release a sweet odor when crushed or bruised. This semi-aquatic perennial needs moist to wet soils in partially to fully sunny locations. The grassy-leaved sweet flag performs well as a ground cover around bog gardens and water gardens. Lesser periwinkles (Vinca minor), also called creeping myrtles and dwarf periwinkles, belong to the Apocynaceae plant family and prefer humusy, wet soils in part to full sun positions. Indigenous to Europe and South Russia, this perennial typically grows well in USDA Zones 4 to 8. The lesser periwinkle ranges from 3 to 6 inches tall with spreads ranging from 6 to 18 inches. The tubular, light purple to blue flowers bloom in May and June and bears evergreen leaves and many trailing stems. Lesser periwinkle plants can spread quickly and aggressively into other garden areas. Gardeners often use the lesser periwinkle for ground covers on banks and slopes. The flame violet (Episcia cupreata) belongs to the Gesneriaceae plant family and features green, crinkled leaves covered with tiny, purple and copper flecks. This seasonal bloomer also features orange to deep red flowers with bright yellow throats and ranges from 9 to 12 inches in height with spreads up to 2 feet. Native to Brazil, Colombia and Venezuela, the flame violet does well in USDA Zones 10 to 12. It prefers organic, dry soils in partly to fully shady locations. Fungal leafspots, mealybugs and leaf scorch sometimes occur. The flame violet works well as a ground cover and a hanging basket plant. Lesser celandine plants (Ranunculus ficaria) belong in the Ranunculaceae plant family and prefer moist to wet soils in partial shade positions. Naturally occurring in Asia, Africa and Europe, this perennial typically performs well in USDA Zones 4 to 8. Mature plants range from 3 to 9 inches tall and 6 to 12 inches wide. Lesser celandines feature deep green leaves and vibrant, yellow flowers that bloom from March through May. This plant tends to form dense mats that prevent other vegetation from growing and typically dies back for summer dormancy. Snails and slugs often feed on the leaves. 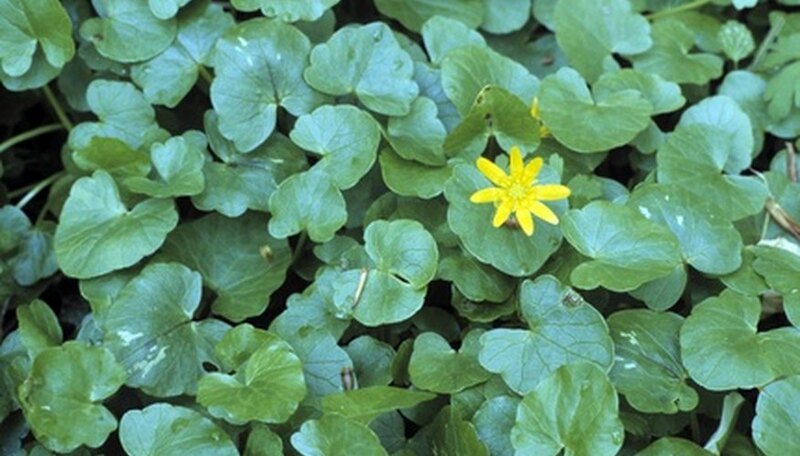 The lesser celandine generally performs well as a spreading ground cover in moist, woody areas.